A detailed Machu Picchu travel guide: explanations, facts, information and pictures of all the highlights within Peru’s ancient Inca ruins. Machu Picchu might just be the top bucket list item. Ever. 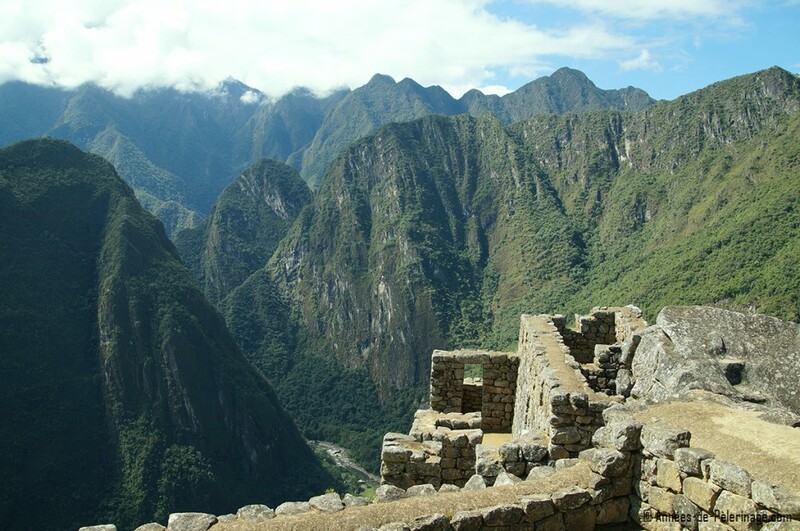 The lost city of the Inca certainly appeals with picture perfects scenery. Unlike in 1911, when famous Hiram Bingham supposedly rediscovered Machu Picchu in the middle of the Peruvian jungle, it is no real problem getting there these days. Since the grounds of the ancient site are quite large and there are hardly any descriptions to be found, it pays off to prepare in advance. I hope this article will be able to give you a good impression of what to expect. I tried to squeeze in as many Machu Picchu facts and information as possible, while still keeping it brief and entertaining. Feel free to skip a section or two, or ask any questions in the comments below. I am no archeologist – just an experienced traveler sharing his impressions. All pictures were taken during my stay in May 2015. I wrote about my spectacular hotel here in case you are still looking for a hotel. If you are currently preparing a trip to Machu Picchu, it might also pay off to check out my article on the Dark side of Machu Picchu that will prepare you a bit for all the things you can expect at Machu Picchu, besides the (admittedly) picture perfect view. Machu Picchu is precariously located on a very steep mountain. Yet for Peruvian standards the site is actually very low – only 2,420 meters above the sea level (read more about the height & risk of altitude sickness here). Coined as a New Seven Wonders of the World, there are only two entrance points into Machu Picchu: The main entrance and the Gate of the Sun. While the latter is reserved for those accessing Machu Picchu via the Inca trail, most of the maximum of the roughly ~4,000 people allowed to enter the ruins per day will take the main entrance (Note: there are plans to allow more visitors in). 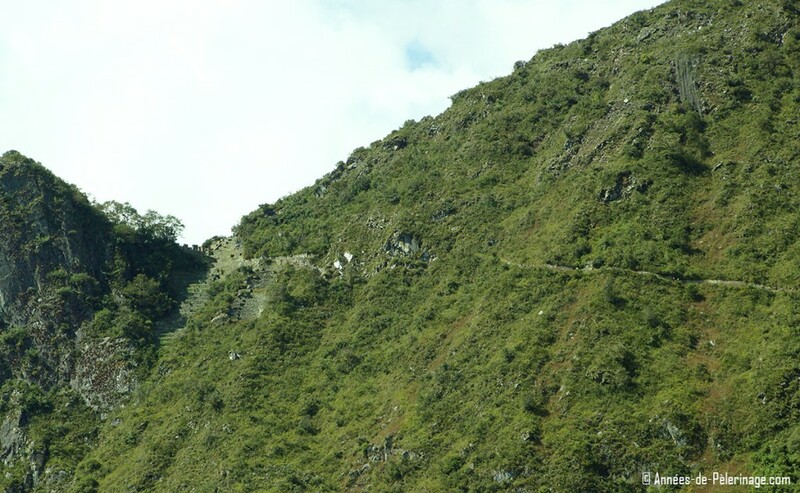 A bus will take visitors on a precarious mountain road from Aguas Calientes (where the train station is located) to the top, and drop them out right in front of the entrance. From there you actually just have to follow the signs. There really is no way to get lost. Just follow the circular path around. In fact, there are guards all around Machu Picchu watching out for any errant visitors or any forms of misconduct (there have been a few naked..uh…transgressions lately). Machu Picchu has been built around 1450 AD but was abandoned around the time the Spanish came to Peru. 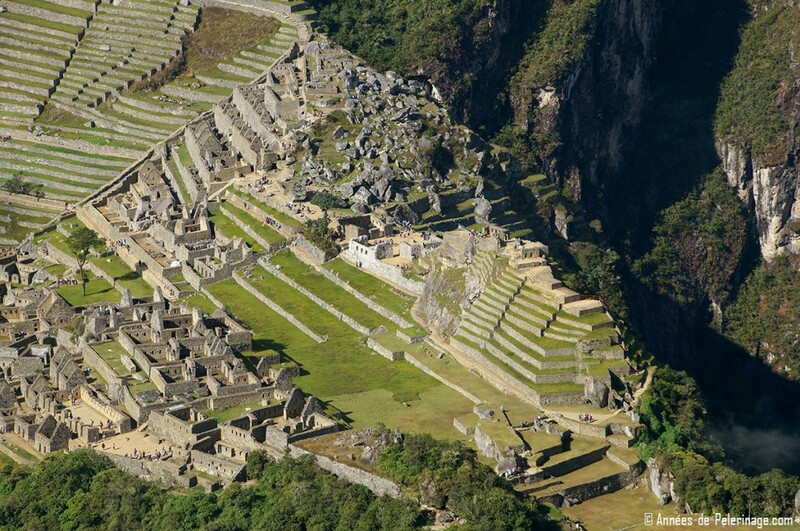 A huge portion of Machu Picchu has been restored, though it will probably always remain a ruin. There are a couple of different tickets options to enter Machu Picchu. As there is usually a bit of confusion around these, I listed all three options you got. 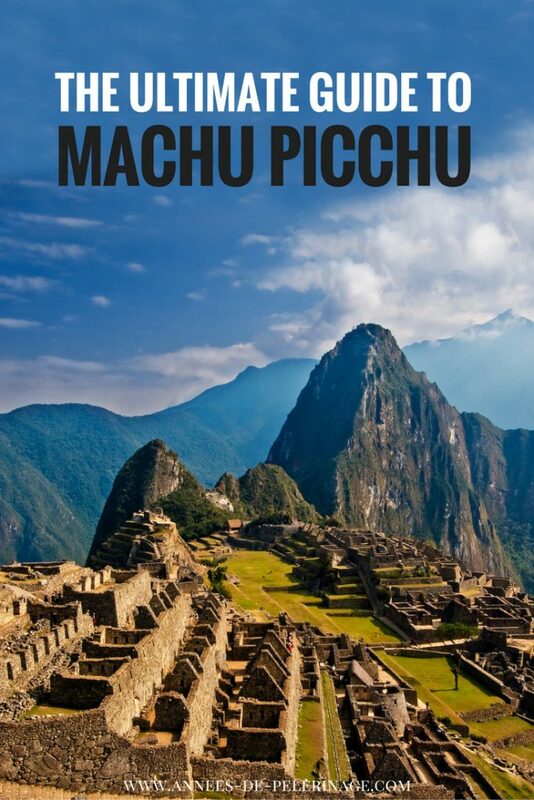 You cannot, stress, you cannot get tickets for Huayna Picchu or Machu Mountain without a Machu Picchu ticket. Student & Children: 65 Soles (19 USD)This is the standard ticket. 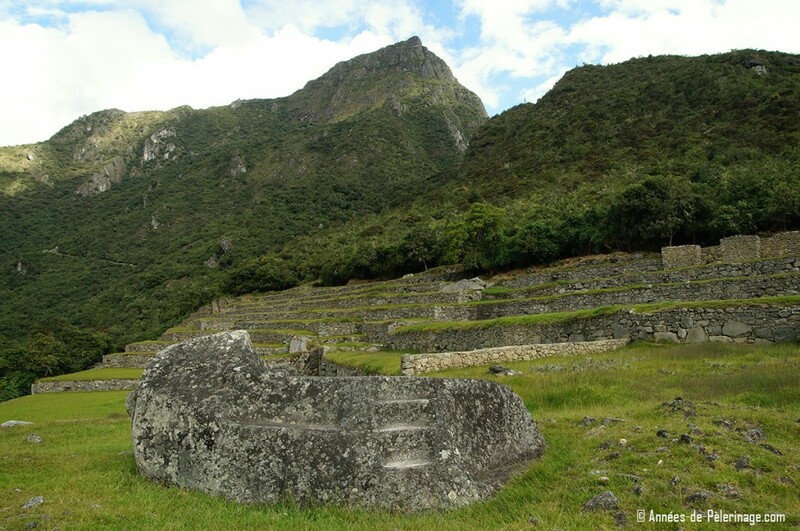 You will be able to see ALL the ruins, but you will not be able to climb any of the mountains around Machu Picchu. Important: Starting from July 1st, 2017, you can either buy a morning or an afternoon ticket at a discounted rate of 65 Soles. Read more here. 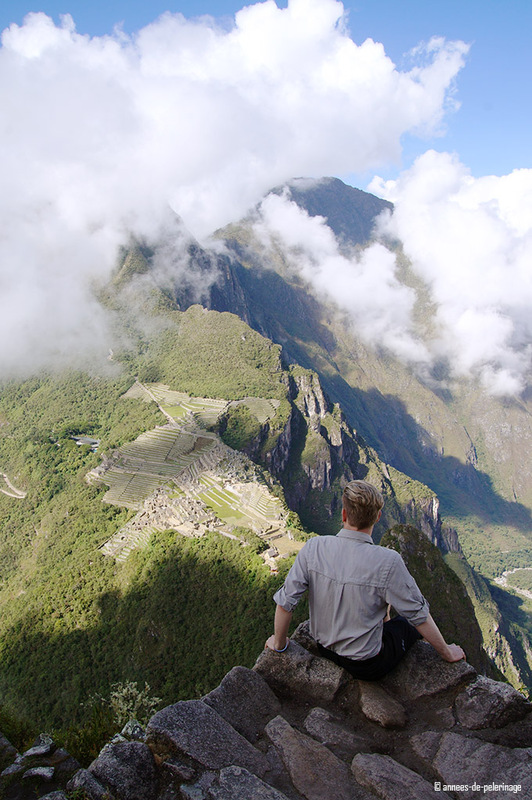 Students & Children: 77 Soles (22 USD)Huayna Picchu is the impressive mountain behind Machu Picchu. With this ticket, you will see the ruins and be permitted to climb the “young peak”. Also, gives u access to the temple of the moon. There is only one hotel directly in Machu Picchu (The Belmond Sanctuary Lodge). All other tourists have to stay in Aguas Calientes and then hike up to the Inca ruins (here’s a list of the best hotels near Machu Picchu). There are three different ways to do so. Starting from 5:30 am buses leave from Aguas Calientes to Machu Picchu. The ride takes about 30 minutes. This will cost 24 USD for a round trip. From Aguas Calientes there is also hiking the trail up to Machu Picchu. This option is for free and will take you 60 to 90 minutes covering 400 meters of altitude. There are many treks into Machu Picchu. The classic Inca Trail takes 4 days (25 km) and will cost you around 500 USD depending on the agency you choose. You need tickets and an official guide. You cannot go on your own. 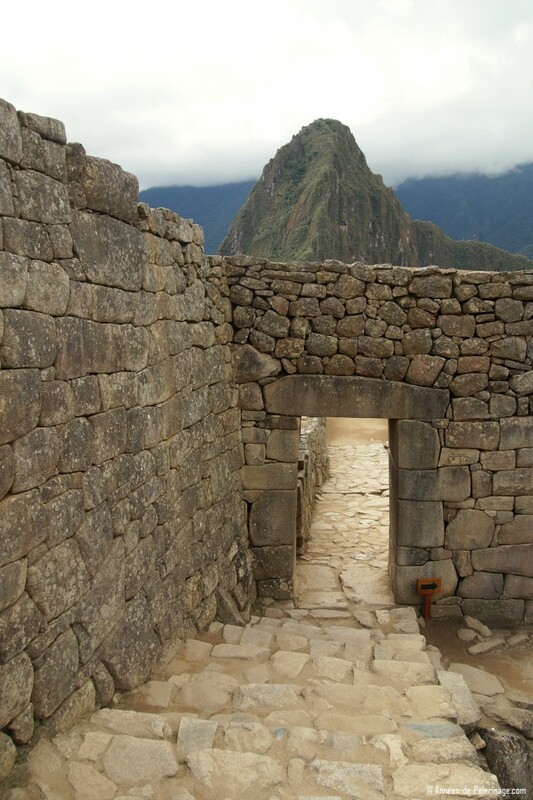 People who take one of these treks, will enter Machu Picchu through the Sun Gate (see below) and then stay for a night in Aguas Calientes after the tour through Machu Picchu. Here’s my full guide on how to get to Machu Picchu from Cusco and beyond. If you are looking for the cheapest (but also slowest) way to get to Machu Picchu, read my special guide on how to take the bus. 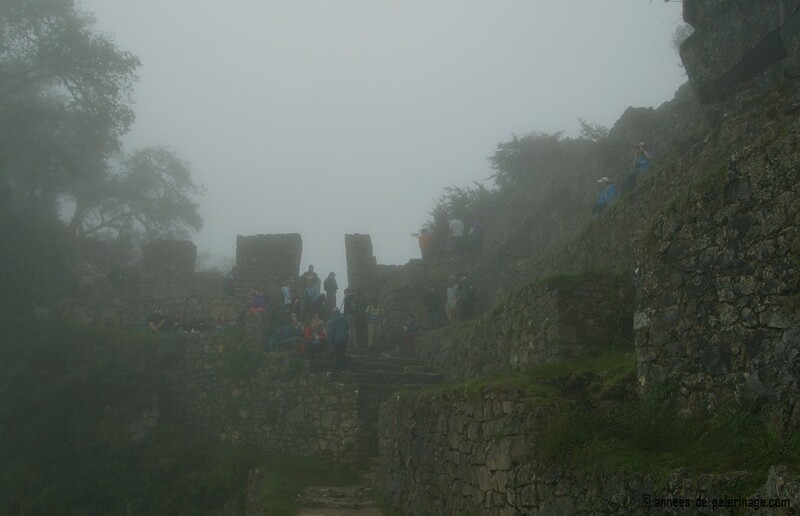 The weather in Machu Picchu is pretty constant throughout the year in terms of temperature & humidity. During the daytime, you can expect temperatures around 25° Celcius throughout the year. Rain, however, is a different matter. While there is hardly any precipitation from May to August (dry season), it rains so much between November and March that parts of the ruins actually sometimes close down. 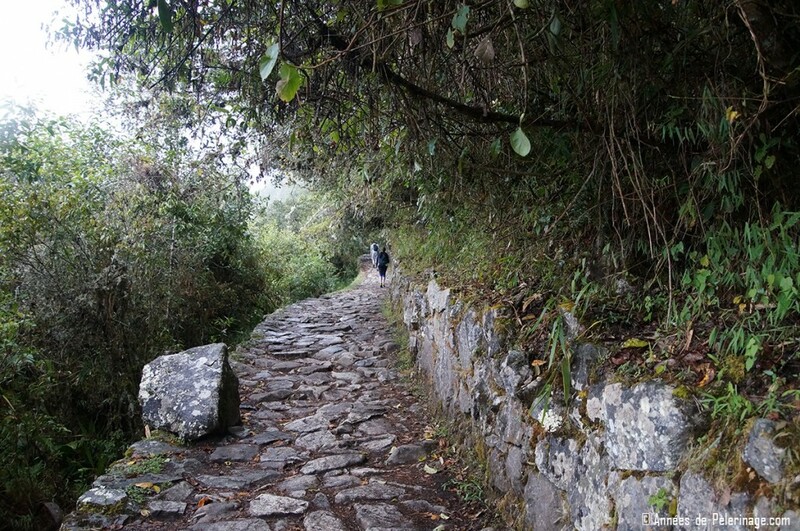 The Inca Trail and the climb up to Huayna Picchu are always closed in February for maintenance work. 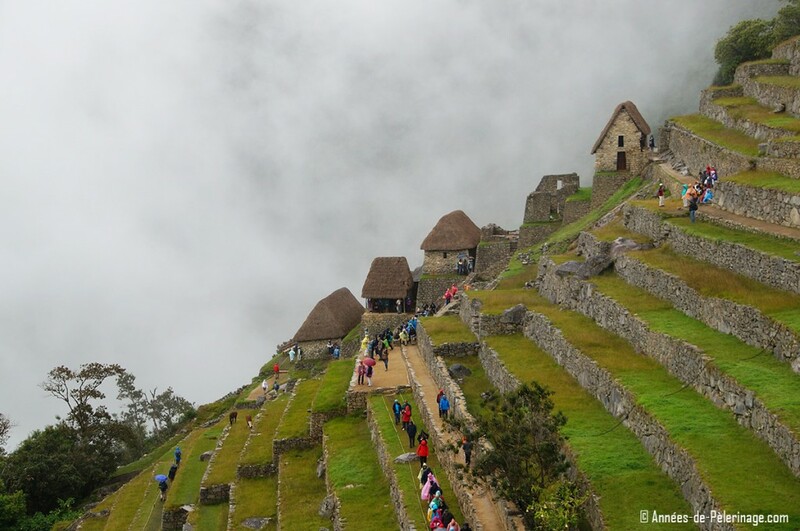 Read more about the weather in Machu Picchu & the best time to visit here. There are a lot of different distinct sites within Machu Picchu and I thought it would be a good idea to present you with a visual tour. You might not remember it all, but even if you just remember a bit, it will add a lot of depth to your visit. You will start your walk around Machu Picchu on a narrow pathway that will soon branch off to the left on a somewhat steep incline. To the left, you have the chance to visit the Gate of the Sun (Intipunku) and Machu Mountain (more on those later). Moving onwards, the House of the Guardians will appear at the very top of Machu Picchu, offering the first and also best view on the ruins. Here is where the iconic picture of Machu Picchu is taken. You really can’t miss it, because there is a sign actually telling you to take a picture. Watch out for selfie sticks and be patient if you want a picture without strangers on it. But what is the House of the Guardians? Well, technically speaking, you are not inside Machu Picchu here, but outside the city walls. Hiram Bingham thought this structure had been manned by pickets and so coined it the House of the Guardians, even no written or oral record hints at the actual usage. Either way, it remains a fact that this is your best view on Machu Picchu. So do look for a nice place to sit and enjoy the scenery. Obviously, you can come back at any time later on, but since the weather can change rather quickly, rather be safe! The place where you are standing is sometimes called the agricultural sector because there is little else than terraced fields (spectacular as they may be). The House of the Guardians or sometimes also called Watchman’s hut stands at the top of it all. Right behind the House of Guardians, you will find the so-called Funerary Rock. Human remains have been found in this area, indicating that it might have been used as a funeral site. All this is speculation without facts since no written records exist. This is why calling the area behind the Funerary Rock “The Cemetery” might be a long shot. Machu Picchu, however, was a huge Inca country estate and this place at least had the looks of a cemetery the site must have had. Some of the rocks show carvings (looking like drainage). There has been a debate about whether this site has also been used for sacrifices (human and/or animals). Looking down on Machu Picchu from the House of Guardians you cannot miss a big staircase. 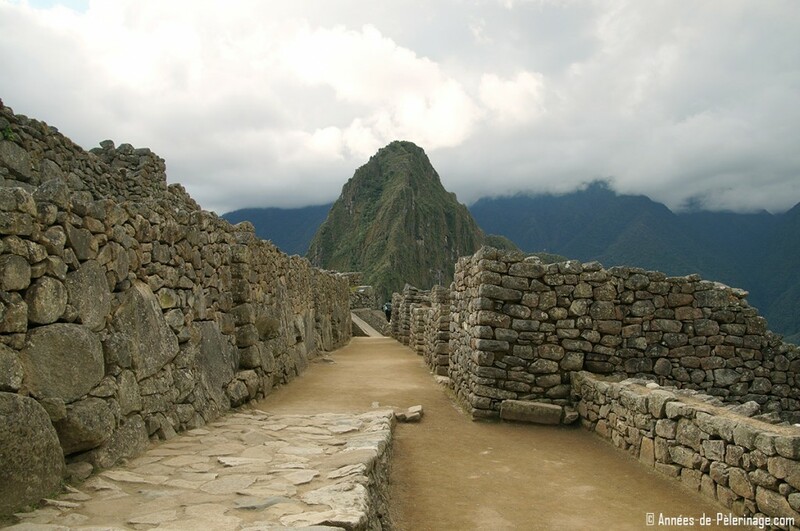 This is the Main Stairway of Machu Picchu and it follows the city wall of Machu Picchu. 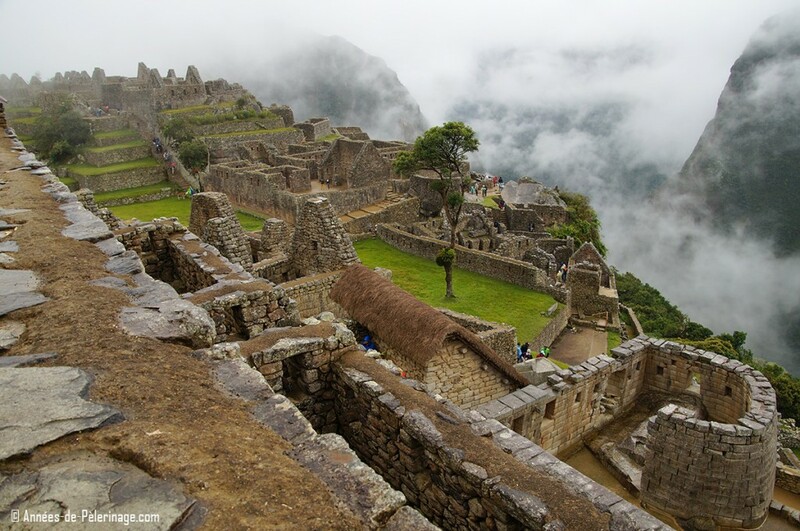 Inca history hasn’t been pretty and this citadel was also built for protective reasons. Follow the path down and enter the city proper through the Main Gate. You will first see the urban sector, where the common citizens had been living. Houses here were rather small and narrow and once thatched with straw under wooden beams. Do note the architecture and how stones have been set rather simple, as opposed to royal houses and temples you will see later on your tour through Machu Picchu. If you look to the right you will not only a have a beautiful view of the valley below, but also see a quarry. Machu Picchu has never been finished and in this place, you can clearly see that. Just why it has been abandoned before it was finished remains unclear. Before the Spanish defeated them, the Inca Empire suffered from a succession war and lost almost 2/3 of its population to a tragic smallpox epidemic. 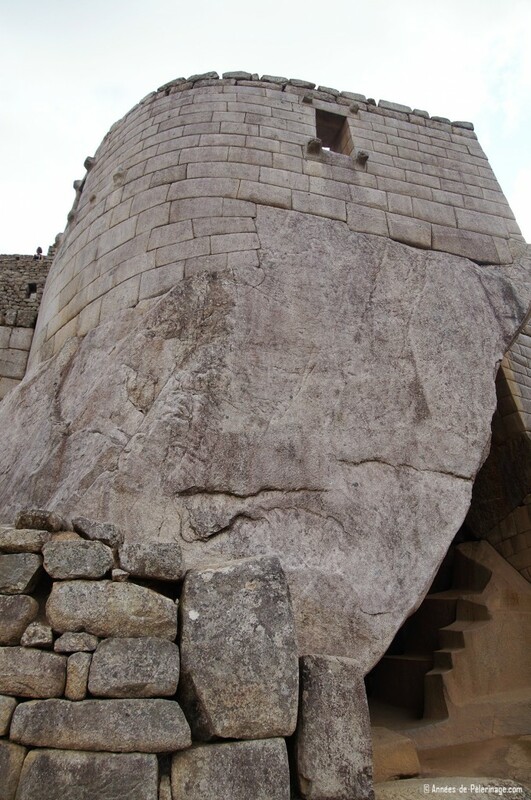 Maintaining Machu Picchu probably had been just too expensive. As you follow the meandering path through the urban sector (do explore the grannies and niches! 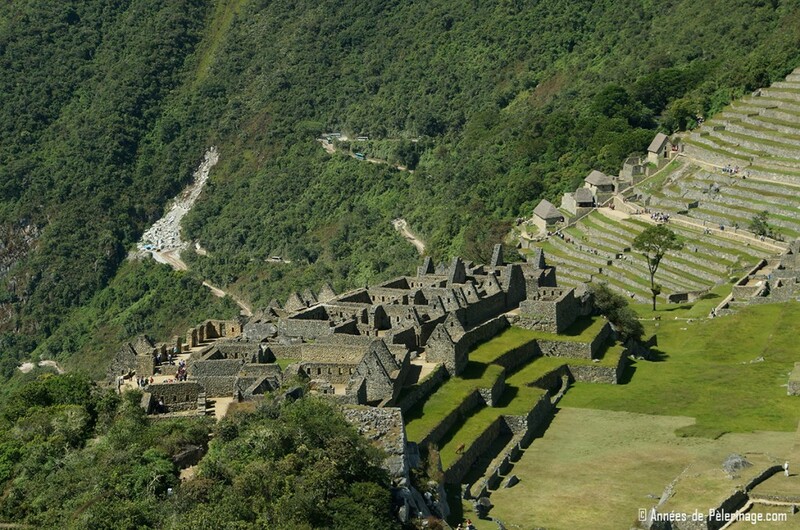 ), you will ultimately end up at the main temple of Machu Picchu. This square probably served as a staging area for important rituals and gatherings. It is often called Sacred Plaza. Machu Picchu has probably been a ritual center and not so much a real city (unlike Cusco or Pisac). The main temple consists of huge walls that have once been perfectly set. You can clearly see plenty of niches in the walls. Once sacred objects (huacas) would have been placed here. Imagine golden figurines depicting the gods, but also mummies of important ancestors. The temple, quite clearly, lacks the fourth wall. Just why remains unclear. 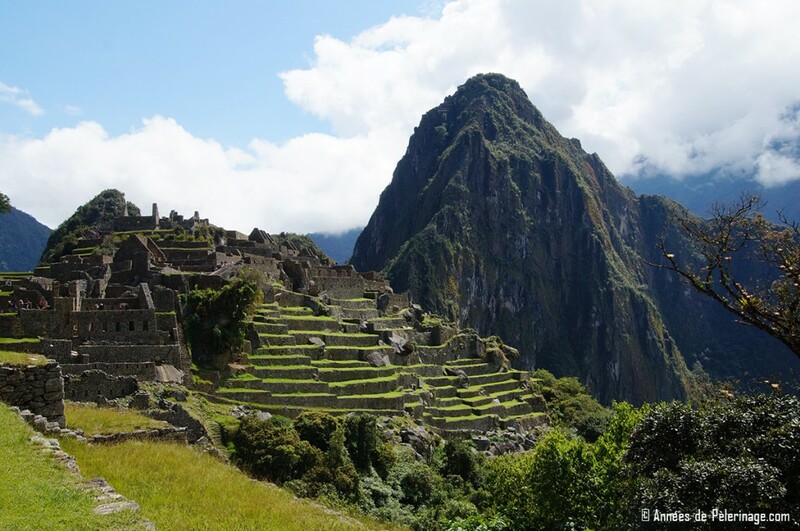 Some experts think by intention, others see it as further proof that Machu Picchu was never finished. Some believe there is a little sacristy attached to the main temple (on the backside), where a small sleeping pallet made from stone can be seen. I am not sure if this theory can withstand sound archeological proof but do judge for yourself. 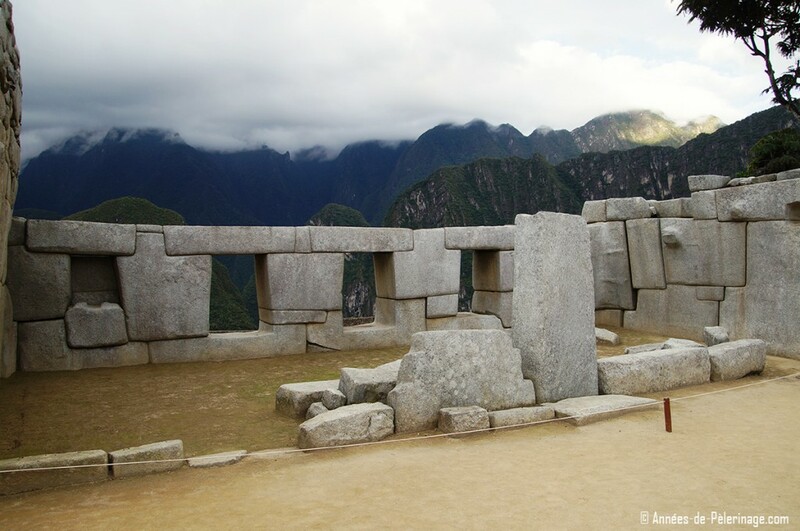 Right next to the main temple, you will find another big highlight within Machu Picchu: the Temple of the Three Windows. The temple is insofar very significant because it holds inscriptions from Agustín Lizárraga and his three followers dating back to July 1902. Almost ten years before Hiram Bingham “rediscovered” the site. The Temple of the three Windows has also only three walls and originally must have had 5 windows. Massive as they are, they represent the underground world, heaven and the here and now. The large monolith in front of the windows also has three levels. This sacred rock was used for rituals, much like an altar. The Intihuatna is perhaps the most significant ritual site within Machu Picchu. Behind the Sacred Plaza you will see an artificial hill, sometimes referred to as a pyramid. Abutting the hill you will find an open chamber with a worn down stele of the utmost importance: The Intihuatana – the stone to tie the sun. It is believed that rituals were being held here. The astronomical function was probably more important, though. In an area where torrential rains frequently cause landslides, predicting seasonal weather patterns ensured the survival of the crops. We do, however, not know exactly what the full extent of the Intihuatana was. Important Machu Picchu fact: The Spanish razed all the know Intihuatanas (e.g in Tipon; read about the spectacular water gardens of the Inca here). So the one in Machu Picchu is the only one left intact. The main square more or less divided Machu Picchu into different sectors. 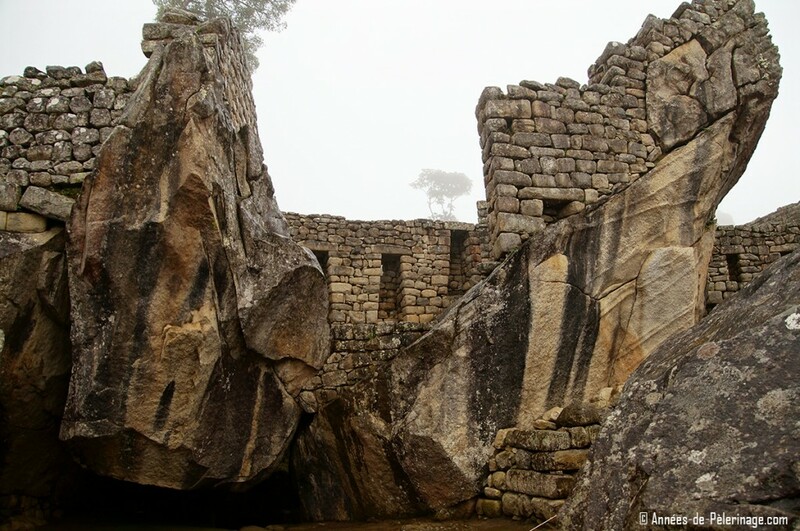 It is believed that high ranking Inca took residence in the area close to the important temples, so directly in the vicinity of Inithuatana and the Sacred Plaza. Crossing the main square you will soon come towards a little outpost. Two thatched roofs are crowded around a huge slab of natural rock. Insiders call it the Sacred Rock, though whether it really was a ritual site remains unclear. The architecture strongly resembles the one around the Sacred Plaza, meaning two buildings (though of cruder masonry) with only 3 walls facing a central stone. 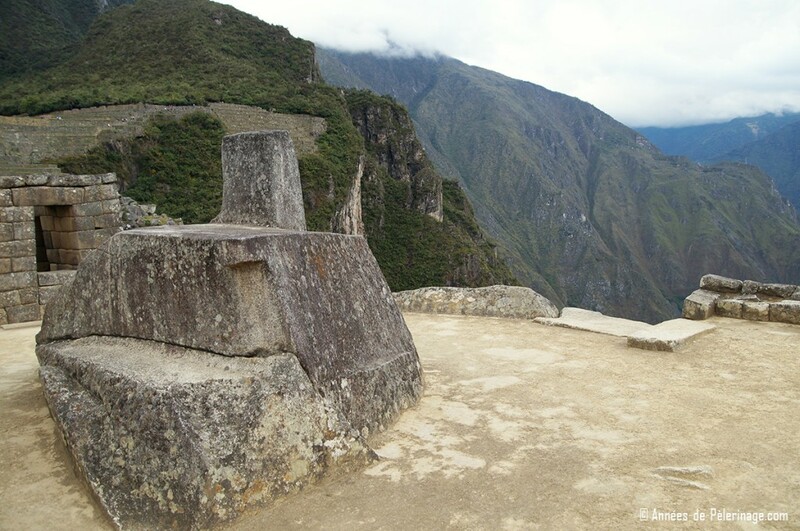 The Sacred Rock with its 3 meters of height marks the north-most point inside Machu Picchu. 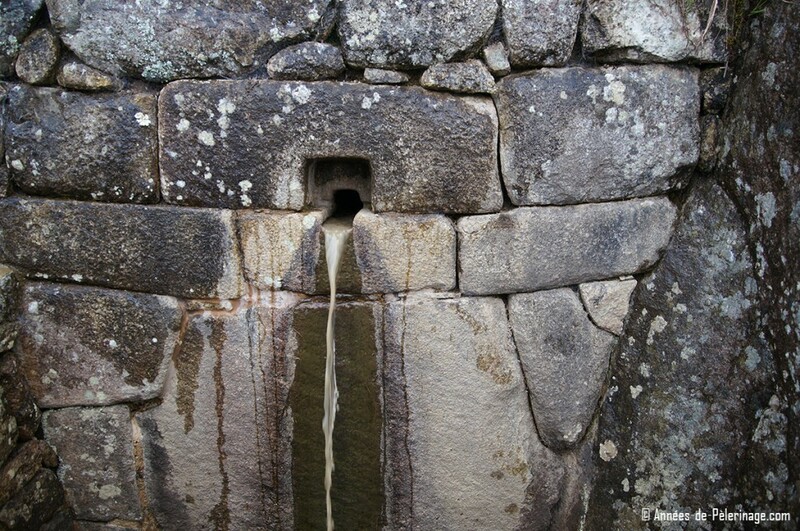 Perhaps the most significant fact: This area is the portal towards Wayna Picchu, a mountain the Inca probably revered at this site, thinking it contained one of the higher spirits (apus). 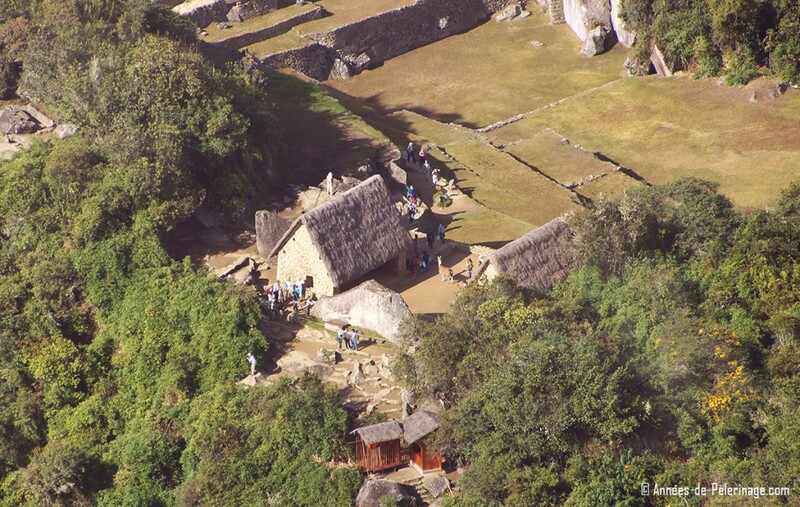 If you bought tickets for getting the best aerial view of Machu Picchu, this is where you will have to start. Wayna Picchu is often called the Stairs of Death, because the way up is almost vertical, without any handrails or other security measures. If you want to know what it’s like or prepare your visit, make sure to read my extensive article on climbing Wayna Picchu. Following the circular path through Machu Picchu, your next step will be the industrial sector and its many factory houses. Know then, that this is again only a hypothesis. Some mortars were found in this area that might have been used for grinding dyes, essential for pottery or weaving. Some archeologists believe, however, that these “mortars” were in fact cup holders, or rather jar-holders. The ferment maize-beer is still popular among the working class (in case you are interested: I got to sample it on my trip to the Maras salt mines) and would have been stored in pointed vases. Maybe they also were only water basins. In reality, it probably was another ritual site, one that might have involved the sacrifice of animals and humans. The Condor-god (Apu Kuntur) is still being worshiped in the whole Andean region until this day (culminating in a festival called Yawar Fiesta). So this was another important temple often called the Temple of the Condors. 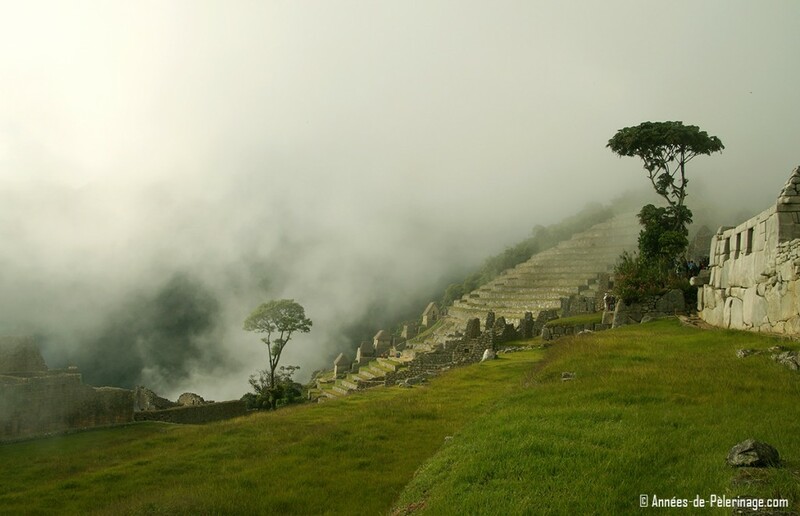 Taking the stairs further uphill, you will get to the inner sanctum of Machu Picchu. Here you will enter a cluster of perfectly built houses known as the royal palace. 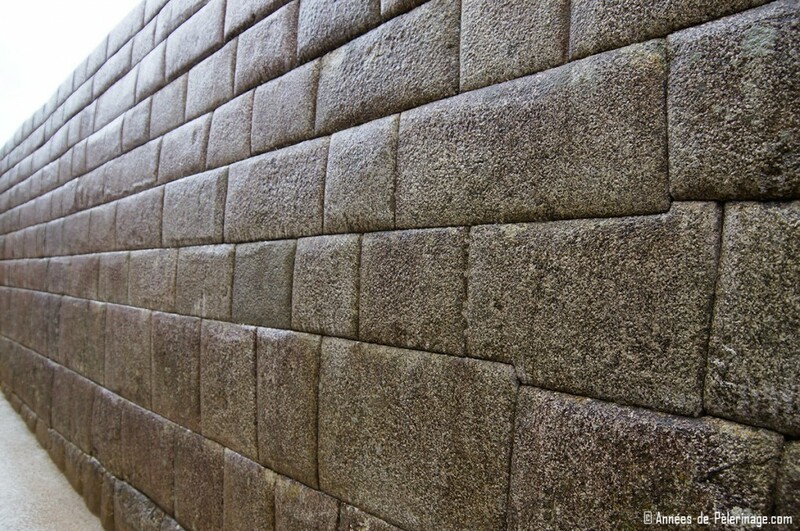 Both the perfect masonry and the vicinity of the Temple of the Sun make it very probable that this is where the Inca king and his family resides on their stays in Machu Picchu. It is, in all earnest not particularly large. Do not forget, however, that Machu Picchu was not the center of the Inca Empire. That was Cusco. Machu Picchu was probably just one of the many royal estates around the country and (contrary to what you might think) not a site of great importance. Small ritual fountains and a tomb can be found in this area as well. Everything is very, very close together. The fountains, however, do not work anymore. The source has been cut off. Only during heavy rains water can be seen trickling down. Right next to the Royal Palace you will find the temple of the Sun. The semi-circular building is quite small in proportions. If you want to see the main temple of the Inca Empire, you would have to go to Cusco. The Qurikancha has truly outstanding proportions, even though not all of its former glory remains (find it among the many highlights of my article on things to do in Cusco). Still, mummies and golden objects would have been found here in Machu Picchu as well. Attached to the Temple of the Sun is a small building often called “Nusta’s Bedroom”. This might have been the house of the high priest. After the temple of the sun, you will exit the city of Machu Picchu through the city wall entering a sweeping series of terraces. These terraces were built to perfectly drain the heavy rains and keep the crops and soil in place. If you happen to experience Machu Picchu during one of these downpours, you will quickly realize that the ancient system is still working. Neither pathways nor fields are bogged down. It will only take a couple of minutes for them to dry afterward. Quite a marvelous feature! If you were to cut through one of these terraces (as archeologist did), you would find many different layers of gravel and soil. God alone knows how long it took the Inca to figure out this system. 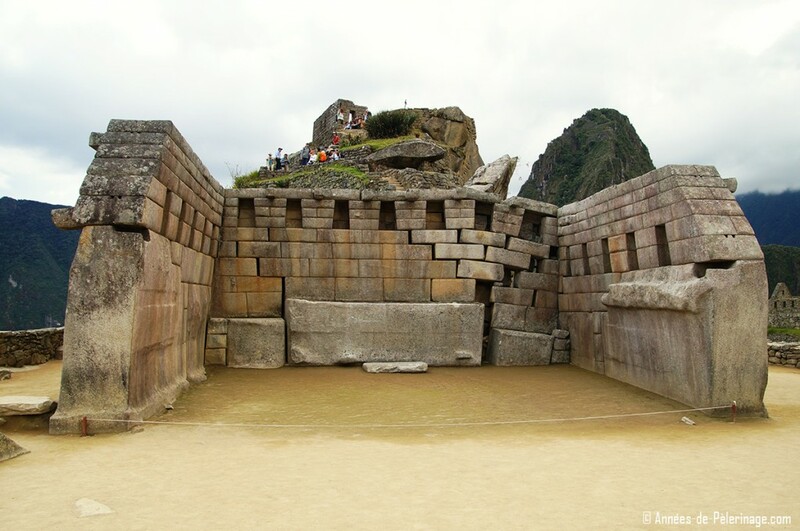 At the end of your tour through Machu Picchu, you will see a couple of granaries. Their roofs have been restored to give you a proper impression of how they once must have looked like. And with these granaries ends the classic tour through Machu Picchu. There are a couple of more highlights you really should not miss. As you are only allowed to enter the ruins with a guide (starting from July 1. 2017) I hope he will be able to point them out to you. There are three different circuits you can choose from. Previously your ticket enabled you to leave the ruins once, but that is no longer possible. So, do go on the toilet before you enter! Behind Machu Picchu, you will see two prominent mountains. Wayna Picchu and Huchuy Picchu, the latter being the smaller one to the left. Special tickets are needed to gain access to these. If you are a fit hiker and not scared of heights, you really should consider checking out the fantastic view of Machu Picchu from up there (as you can see the decline is almost vertical). Some Inca structures can be found at the top, though their significance is lost down in history and I really could not find any sustainable facts or information. It is a very scary hike, but equally as rewarding. 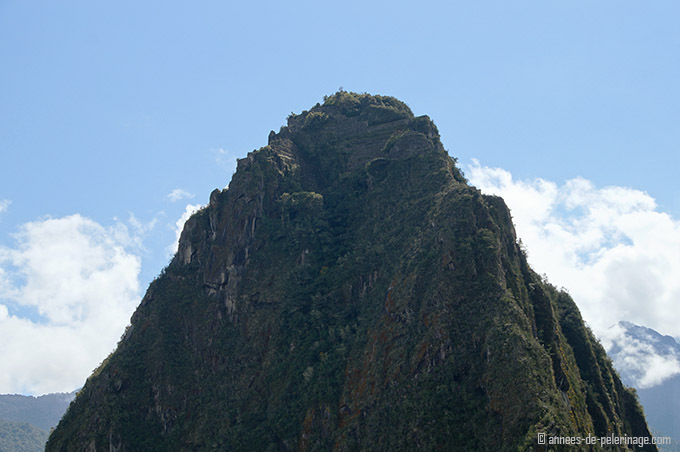 If you are looking for good pictures, do climb the smaller mountain, since Wayna Picchu is actually some 300 meters higher and you will need a very good telephoto lens to get decent pictures from up there. Do read my guide on Climbing Wayna Picchu if you want to know more about it. I also compiled some facts and myths about the alleged Huayna Picchu death toll here. 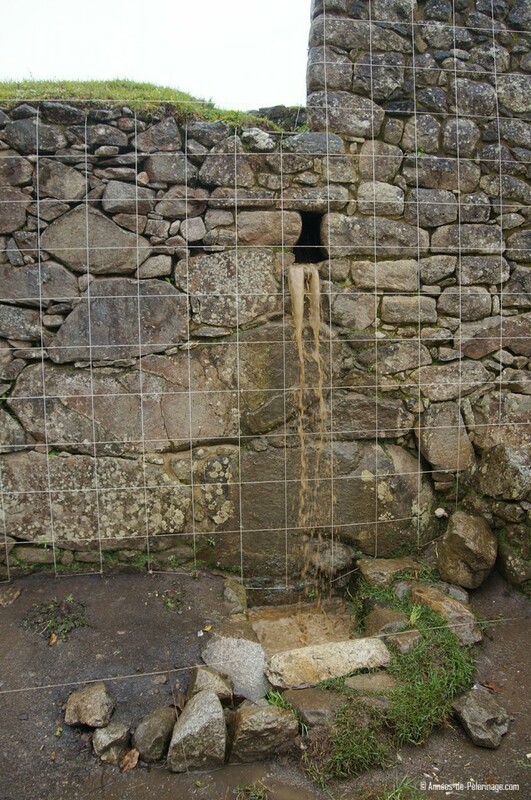 The Inti Punk or Intipunku is one of the outposts of Machu Picchu. It has once been the main entrance of the citadel and probably was a military checkpoint. On top of that, it also was a ritual site, because the sunrise over Machu Picchu can be seen from here, and only from here. 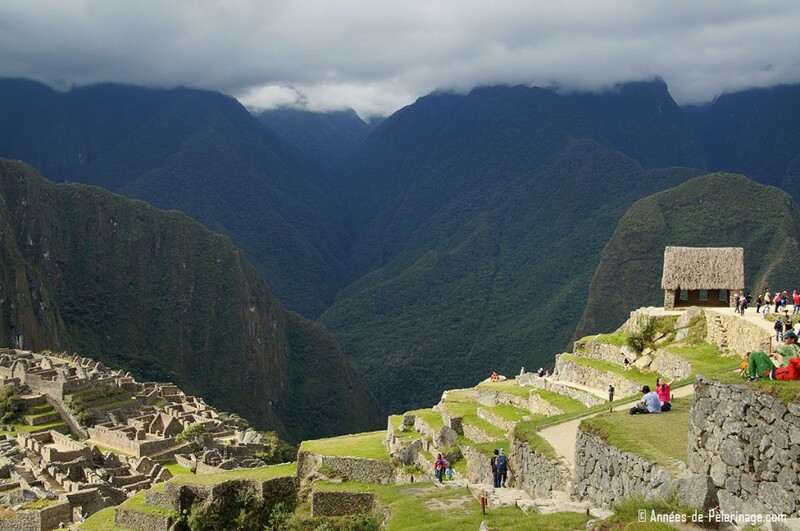 Being some 2,745 meters high, it takes about 30 to 40 minutes to reach it from the main entrance of Machu Picchu. Apart from the last 100 meters, the road is following a very moderate incline. If you are not too fit, but still want to see Machu Picchu from above, this would be your best chance to do so. Travelers taking the Inca Trail to Machu Picchu (something I really do not recommend; more on that later) will enter the ruins through the Intipunku as their very first stop – usually around sunrise. Since Machu Picchu is frequently hidden in morning mists, it is a rare day to actually see the sunrise from here. It thus might be advisable to check out Intipunku after you toured Machu Picchu proper and skip trying to see the sunrise from here. Just decide spontaneously depending on the current weather. If there is rain or heavy fog, there really is no point in hiking to the Intipunku, because the site itself is rather unspectacular (as you can see). 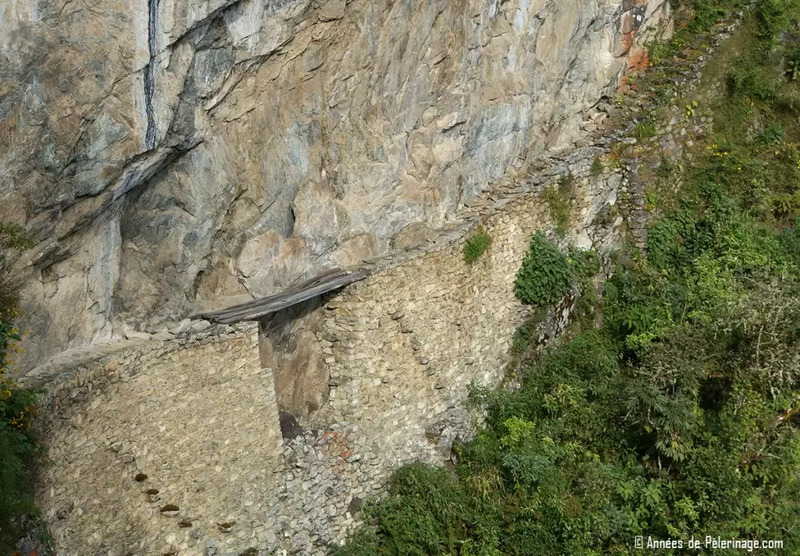 Another way to Machu Picchu (one that is not open anymore) is via the Inca bridge. A small path is branching away from the House of the Guardians and will lead you via a jaw-dropping hike to a very small bridge. The bridge itself is really nothing more than a few wooden blanks. In days past you were able to cross it, but out of obvious security concerns that is no longer possible. I absolutely have to stress that you should not suffer from vertigo if you plan to see the Inca Bridge. It takes about 15 minutes of fast walking to reach it and every single meter you will face a vertical drop of 500 meters with only a small handrail. Last but not least a few words about the Inca Trail. Most travelers will arrive via train to Aguas Calientes and then take the bus up to Machu Picchu. 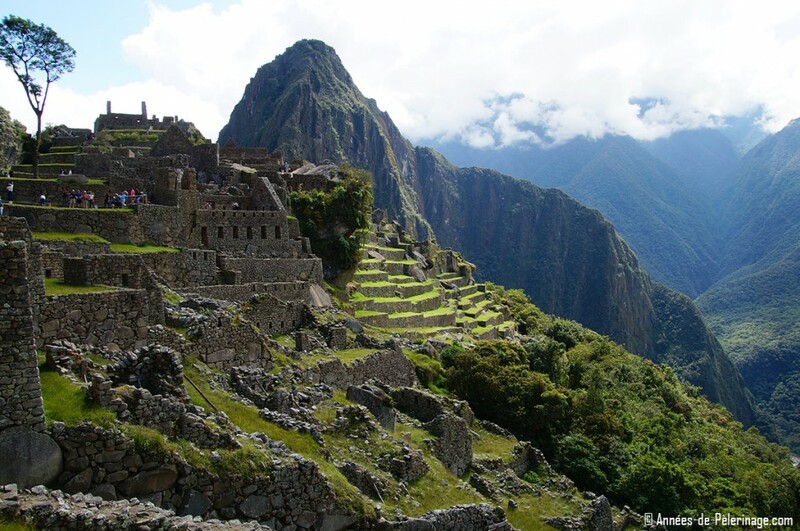 You can, however, also opt to hike the original Inca trail on 4 or 5-day itinerary. The fun part about it: Along its 104 kilometers you will cross a host of other Inca ruins and cross the Peruvian cloud forest with its many animals and plants. 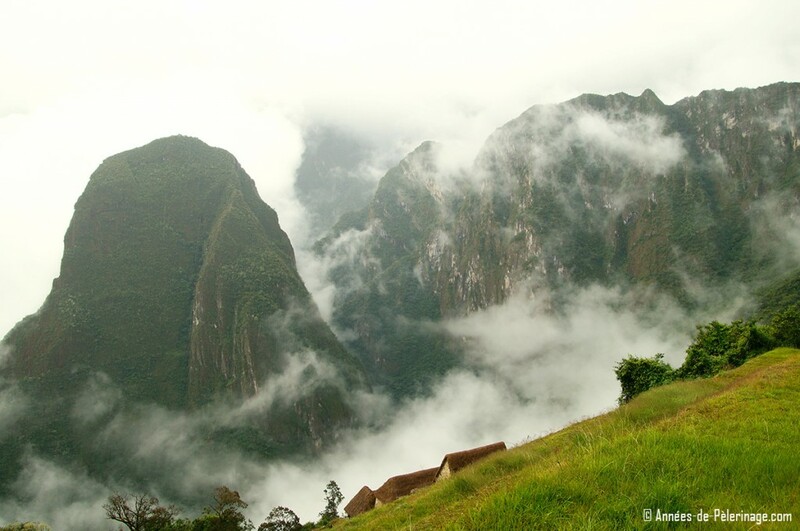 You will also ascend to approximately 4,200 meters of altitude before you descend into Machu Picchu. These days the Inca trail is better described as a business. The government actually had to regulate the traffic there, because it sometimes felt like a highway. So you actually have to get tickets to walk there and they are severely limited. Still, you will by no means be the only one on the trail. I wrote a little article on the times it takes to hike the different trail options and Machu Picchu in General. Check it out here. I do not recommend taking the Inca Trail, even though most people there will have a great time. Why? First of all, it’s crowded, it is considerably expensive, but above all, it really offers nothing unique. Ancient ruins can be found all over Peru, and there are certainly better hikes to be found as well. It’s a tourist product and one that will only reveal touristy things. Rather plan your trip directly to Machu Picchu and use the spare time to explore the rest of the country – you certainly won’t regret it. With 5 days you could go to Lake Titicaca. Check out my Peru itinerary to see what is possible even in 2 weeks. Having toured Machu Picchu multiple times I can only attest: It is a New World Wonder. The site is nothing short of spectacular. I might have written about the Dark side of Machu Picchu, but above all Machu Picchu will deliver upon its promise. One of the Machu Picchu facts that seldom surfaces: The site actually has only little historic relevance. At the end of the day, it was just a royal country estate some 500 years old. I grew up in a house that was almost twice as old and still intact. It is the beauty of the location, along with the crumbling ruins that will captivate you. It is also reminiscent of all the things the South American people lost after the Spanish invaders conquered them. Absolutely do go! And don’t forget to check out my Peru packing list. Won’t do to leave important items at home, eh? I hope my rather lengthy guide was able to fill in some blanks around all the important Machu Picchu facts. Any questions left? Let me know in the comments below! Hi, loving your site! Lots of great info. I do have a question about entering Machu Picchu. So we plan on arriving and spending the night in Aguas Calientas. We will arrive by train so that would be around 10:30am-11am. When seeing M.P I know you need a “ticket”. Is it possible to go and see M.P. from above (the scenic photos of the whole site) without a ticket? I was thinking we would go up on the day we arrive to just view it and then with a ticket, go the next day to explore the ruins and climb Wayna Picchu. I hope I’m making sense. lovely question and one that i have been asking myself ahead of my first visit to Machu Picchu as well. You do need a ticket, and you do need to apply way in advance. There is no way to see MP without a ticket. 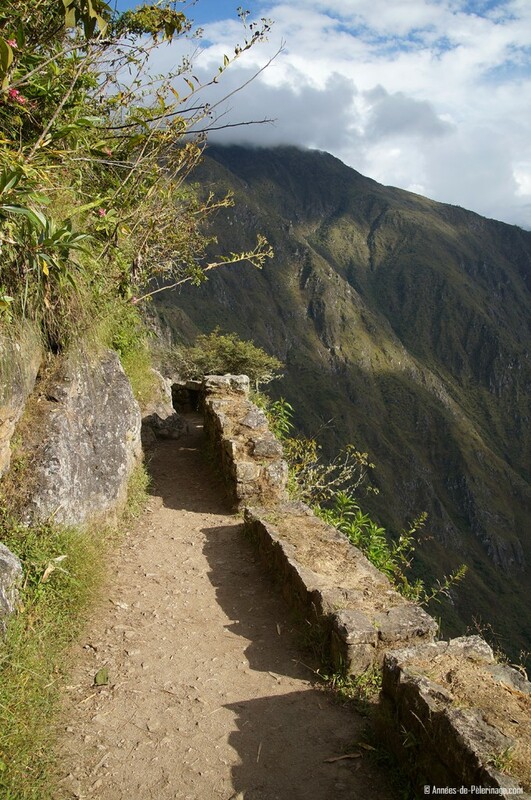 Access to the mountains (Machu Mountain and Wayna Picchu) is only possible from within Machu Picchu. Obviously you will have need to be staying there. So to put it in a nutshell: You’d have to buy tickets for two days. If you plan to hike Wayna Picchu or Machu Mountain that actually might be advisable. These hikes take quite a long time and are quite exhausting. Depending on when you go it might acctually be a good idea, just to make sure you have the weather on your side. But, Machu Picchu is doable in a day if you rise early and stay late. That being said: Aguas Calientes does have a Museum on Machu Picchu, hot springs, a mini zoo and some other things to see. It’s not exactly spectacular, but there are ways to spend the afternoon. Personally i thought Aguas Calientes was one of the most horrible towns in Peru – just so touristy. If you plan to take professional photos, the afternoon will be the best time to be in MP. Thank you so much for your reply. Glad to hear there is something to fill my time in Aguas Calientes. I will consider getting the 2nd ticket though. So glad to have stumbled upon your site! I am preparing for our Peru trip that’s coming up late June. Now I’m thinking twice about our trek of the Inca Trail starting from km 104. I didn’t realized that our trip included a trek but can still change it and just take a later train straight to Aguas Calientes but then what are we to do in Aguas Calientes for an entire afternoon/evening? Might as well just go on a hike?! 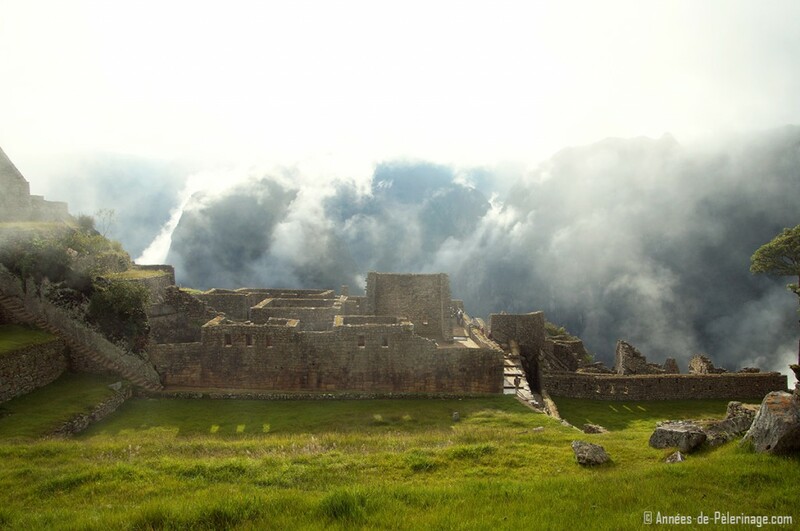 wonderful to hear that you will get the chance to experience this amazing Inca ruin first hand. You won’t regret it. As for your tour. 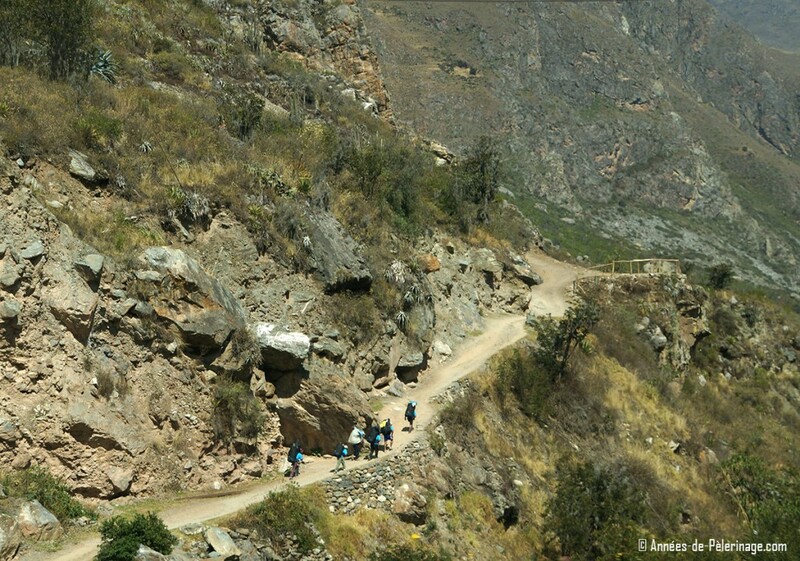 There are different routes for the Inca trail – only the classic trail will be 104 km. There is also a 1-day option, where you just drop out a bit earlier from the train. So I really don’t know what exactly you booked. Speaking from personal experience: Don’t do the full Inca trail and rather spend that time on experience other aspects of Peru (beach, desert, amazon rain forest). Yet, the trek is beautiful (if a bit touristy). Just returned from MP and really appreciated the effort you took to write your guides. I found them very informative, and they helped to fill in some gaps in my knowledge. I am not sure what you mean. The Inca never used hieroglyphs or any real writing system. There is no inscription on the tomb that I know of and if there is, it would have been added recently. Hi I am planning in visiting in march. The train ride takes you all the way up to machu picchu? from there how far do you walk to see the view? Also,where can you get the train tickets? No Julie, you got that wrong. The train only takes you to Aguas Calientes. You will have to take the bus from Aguas Calientes to Machu Picchu proper. Hi, I am planning to visit MP in May 2017. 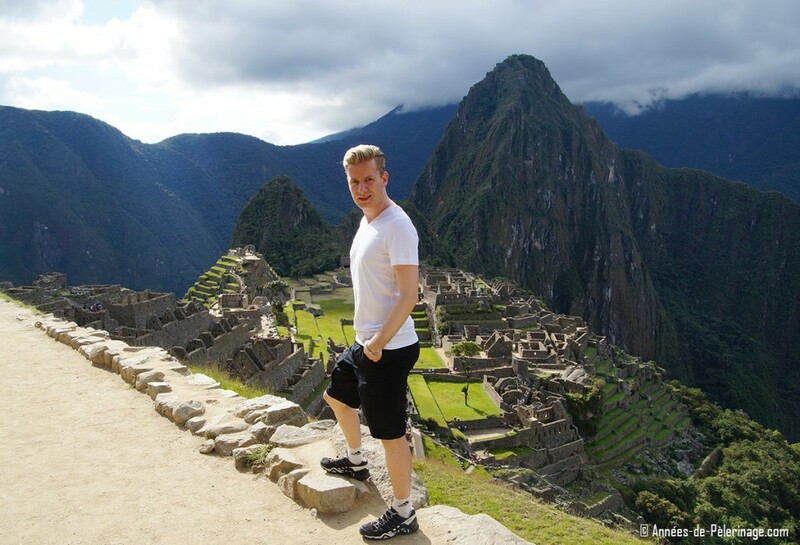 I found your blog to be very helpful specially in regards to the Wayna Picchu hike. 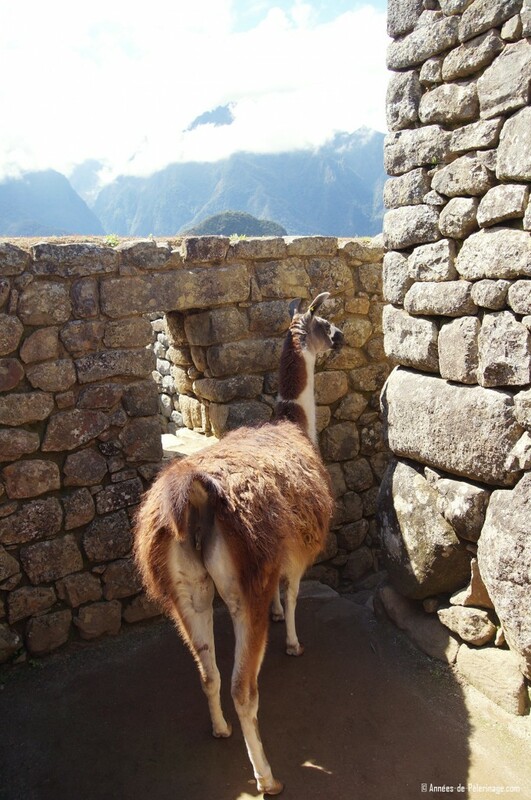 I do not see any thing on your blog on the other mountain (Machu Picchu Mountain) hike. Did you hike it? I would love to see your guide on that if you did. Any comments on that hike, specially compared to WP hike? first of all, thank you for the praise! As for Machu Mountain – I did not write about it, because frankly, I think it is not the better alternative. There are less people on the trail and the mountain is higher. I am wondering your thoughts on making a weekend trip out of visiting MP. We live in Nashville, TN and could catch an evening flight to Cusco on a Thursday, arriving by 10:45 am Friday morning. My thought is that we sleep the majority of the flight, arrive ready to explore, take the train to MP Friday and then explore Cusco Saturday before heading back. Would it be too much travel time to truly see and enjoy MP in your opinion? From what I’ve read a day seems like it would be enough. I found a great deal on flights and this has always been a bucket list destination to check off. that sounds like a tough plan. If you arrive Friday 10:45 am, you could catch a train to Aguas Calientes on the same day (you’d arrive around 4-5 pm). Then on Saturday you could explore Machu Picchu and take the last train back to Cusco. Depending on your departure time, that would give you some time to explore Cusco as well. The Cusco airport is literally in the city. Thanks for the response. I’ve looked into booking at the Belmond, I’m hoping that would help make the trip a little less stressful and help with the altitude. I’m still on the fence but once I have my mind stuck on something I tend to see it through :) Here’s to hoping for easy travels and nice weather! Hm…What makes you think you have to get to Ollantaytambo? There is a train station outside Cusco. You just need to get there :) Will take you about 20 minutes to get from the airport to the train station. But obviously, the train will then take about 3 hours to Aguas Calientes. Loving this article. Would be going to Peru soon! I would say that hiking up to Machu Picchu from Aguas Calientes depends on the weather, your fitness level, and how well you deal with altitude sickness. I really wish I had taken the ATM charges and paid the money to take the bus up. It was raining heavily, my ankle was hurting from a big bite in Arequipa, and I had mild altitude sickness (no nose bleeding, just fatigue). It took me almost 2.5 hrs to climb up, meanwhile my Colombian travel buddy who was used to high altitudes, took a lot less than that. 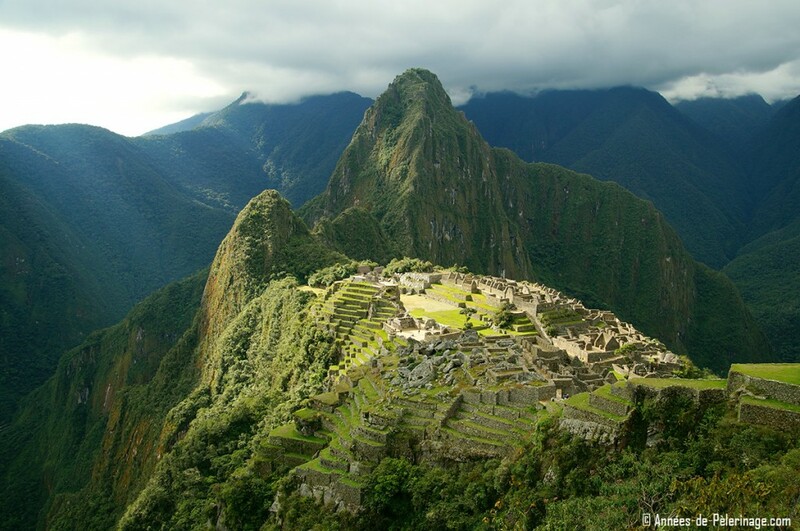 Amazing articles on Machu Picchu – so much relevant information and so well structured. Thank you. One minor thing that confused me so much for i am embarrassed to admit about 45 minutes lol. The “with” needs to be “without”. glad you enjoyed reading my articles. And thank you for pointing out that obvious mistake. I changed it right away! Your website has been really helpful in planning our trip, thank you! glad you liked it. 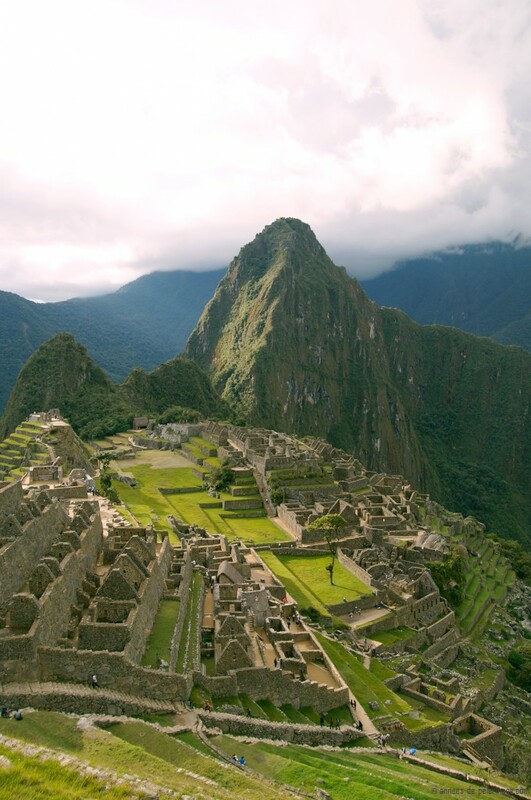 Enjoy Machu Picchu & Peru! I mean, you are visiting in the rainy season and the chances are pretty big there will be heavy rains and clouds. If you have to take a pick, I’d take an afternoon ticket. Norman, I totally understand and appreciate your suggestion. Thank you! 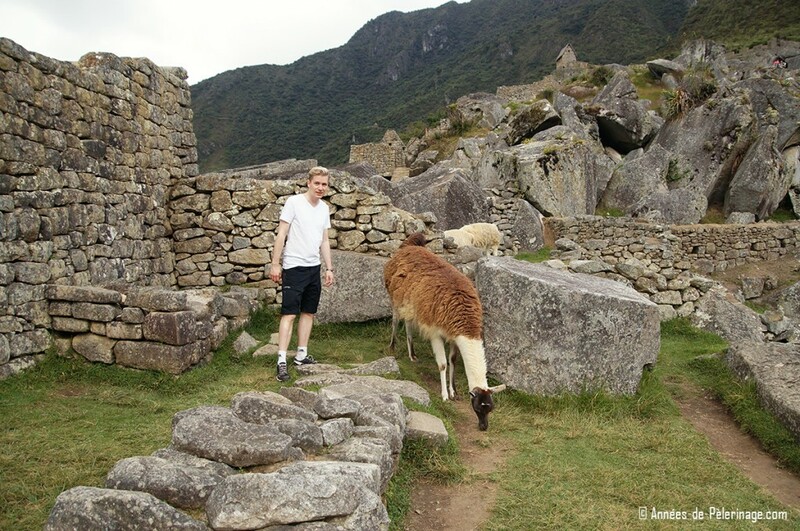 Just used your post on a trip to Machu Picchu March [email protected], thank you very useful. Some updated information for 2019. Machu Picchu will only be allowing 1,000 visitors per hour and you must purchase a time slot ahead of time. In addition you only have four hours to go through the park and it’s all one way, in other words you cannot go back once your through the village. You also need to show a passport for entrance into the park. Which needs to match the passport number on the ticket. You also need to,show your passport on the train to verify your train ticket from Cusco. These new measures where put in place to prevent fraud. Also taking the bus is much better as the lineups are only for the assigned hour. thank you for your first-hand information. It’s much appreciated. I you look further around my blog, you will soon realize that I did indeed write about the further ticket restrictions. You always had to show your passport at the entrance, though!. Thanks for your helpful information regarding Machu Picchu and the Cusco area. We used both of your guides on our recent trip (March 2019). I would like to add a few updates, if I may. The Machu Picchu tickets are now sold even more specifically than AM and PM: we had to choose a specific hour to enter. We’ve seen conflicting information about walking sticks permitted (and not). We used the rubber tips and had no difficulty entering with them, although, to be clear we are senior citizens and have the white hair to prove it :-) We had a guide for Day 1 of our visit and I highly recommend it. We came back for a Day 2 and did not really want a guide, preferring to set our own pace. We were not required to have a guide to enter (the rules may differ during the high season?). Finally, an observation …if coming from Cusco during the winter (rainy season), we had bus, then train transportation to Aguas Calientes (plus the bus up the hill). We decided to spent the night in AC and return to the citadel the next day. We are so glad we made this decision. Out from Cusco and back in one day just wouldn’t be enough time at this spectacular site! Yeah, I know they do sell tickets by the hour now. Should really update that part as well. They continuously change the system to accommodate more tourists. Which is good and bad at the same time. Walking sticks are, strictly speaking, not allowed, as would be entering without a guide. But these rules are, so far, not enforced – especially not for people who clearly need them!